Following the success of last year’s offer, Packt Publishing will be celebrating the holiday season with a bigger $5 offer. Check it out here http://bit.ly/1DQhFk6 From Thursday 18th December, every eBook and video will be available on the publisher’s website for just $5. Customers are invited to purchase as many as they like before the offer ends on Tuesday January 6th, making it the perfect opportunity to try something new or to take your skills to the next level as 2015 begins. I had the opportunity to read the WS-BPEL 2.0 Beginners Guide Book from PACKT publishing. The authors of this book has done a very good job in explaining the concepts in a simple and concise manner. It is a very descriptive and practical guide to a beginners in BPEL. Writing an executable BPEL process is a very different task compared to write code in a general purpose programming language. The reason for that is, you need to have background knowledge on a lot of technologies in order to properly understand and implement a BPEL process. Minimum set of those technologies include SOAP / HTTP web services, WSDL, XML , Xml schema and XPath. Hence , WS-BPEL 2.0 beginners guide takes an ideal approach for a beginner. It starts by introducing the basic concepts and straightaway goes into a practical example. It chooses oracle SOA Suite as the target technology stack and JDeveloper as its development environment for BPEL and provides step by step screen shots on how to implement a process. Next it explains each and every step taken in implementing the sample process and how to deploy and test the process. I find this approach very useful, simply because, when learning a complex technology like BPEL, the best approach is to start with simple exercises to get the feel for the technology and then dive into the more complex topics step by step. This pattern is followed for all the chapters as well. Each new chapter introduces a concept from BPEL, and goes onto a practical example explaining the details and finally testing the process. Hence, when you finish reading the book, not only you will understand the concepts in BPEL, but also, you would have mastered to BPEL development tool. As BPEL is developed mostly by using graphical tools, mastering the development environment is an essential skill for becoming a skilled BPEL developer. The book explains the concepts in words as well as using diagrams. Book covers all the concepts from BPEL specification including topics such as synchronous processes, asynchronous processes, message correlation, fault handing , compensation handling ect. In addition to BPEL concepts, book also covers the WS-Human Tasks space as well. The human tasks tooling capabilities of JDeveloper as well as the concepts are explained in a concise manner. In many practical process implementations in the industry there will be BPEL as well as human tasks. Hence for a beginner, this book is an ideal guide to master the BPEL based workflow technologies. Also, This book can be useful for an experienced BPEL developer migrating from another tool to JDeveloper. Finally , I would recommend this book to anyone who is new to BPEL and is looking for a practical guide to learning BPEL related workflow technologies. Versioning of proxy services in an SOA environment is a common requirement. Versioning is required when you want to add / update or change the functionality of a proxy service without affecting the existing consumers of that proxy service. Above diagram shows a typical versioning scenario. If the change in Service X 2.0 is compatible with Service X 1.0, then we can simply point to service X version 2.0 and consumers will not be affected by the change. However, if the change is in compatible, then we will have to introduce a new proxy service version. 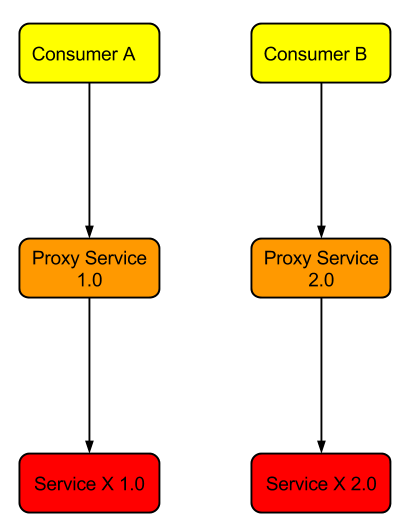 Create two versions of the proxy service. Consumer A can access the version 1.0 of the service and Consumer B can access version 2.0 of the service. 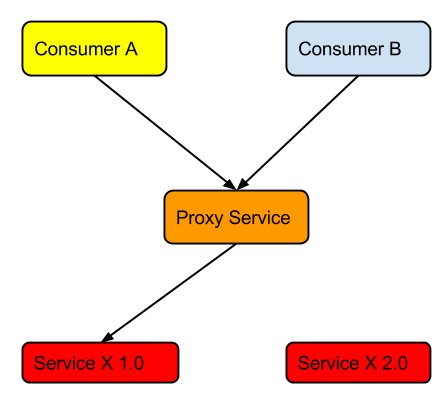 Gradually migrate Consumer A to proxy service version 2.0. This way, consumer A can live with version 1.0 and plan for upgrading to version 2.0. Both versions of the proxy service will exist till version 1.0 is deprecated. Easiest way to version proxy services is to create a new version of the proxy service and related artifacts by appending the version information to the proxy service name. It is best to add version information to artifacts as a best practice. For example consider we have to proxy a web service named StockQuote. Then we can name the proxy service as StockQuoteProxyV1. All artifacts contained with the proxy service should also be named accordingly. For example out endpoint pointing to the StockQuote service can be named as StockQuoteEndpointV1. Now creating and deploying new version of the proxy service becomes a simple task. We just need to update all the related artifacts with the new version number. Another approach to implementing proxy service versioning by having version as an attribute has been tried in the parent synapse project and there is a GSOC project on the same topic. These improvements are planed for future releases of WSO2 ESB. 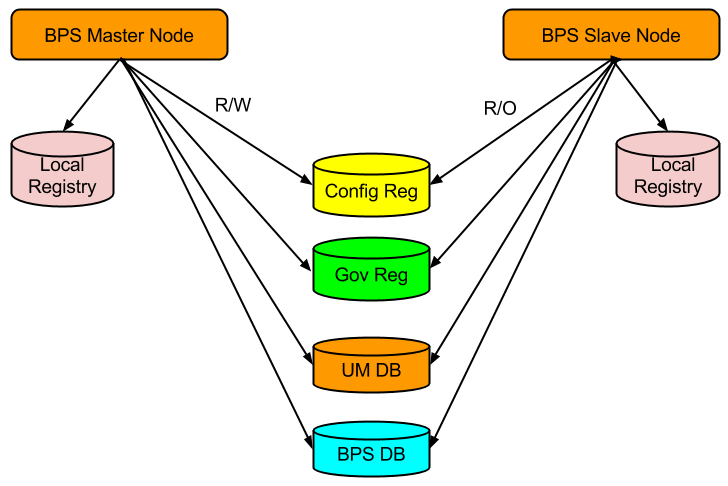 Since BPS is based on Axis2, All axis2 transports are available for BPEL published services as well. I will describe the steps required to consume a message from a JMS queue to complete a BPEL process. We will use ActiveMQ for this sample. Following is the step wise guide to do it. Download and extract Apache ActiveMQ 5.6.
un comment the TransportReceiver and TransportSender sections of axis2.xml corresponding to ActiveMQ. You can find axis2.xml located at /repository/conf/axis2 directory. Copy following jar files from activemq lib directory to /repository/components/lib directory. From the management console , deploy the HelloWorld2.zip file that is available in the repository/samples/bpel directory of BPS. From the services list view, select the HelloWorld service. As you can see, the jms endpoint is also available for the newly deployed process. Now go to ActiveMQ management console and go to queues section. You will find that there is a queue named HelloService. Use the send to section to add a message to the HelloService. 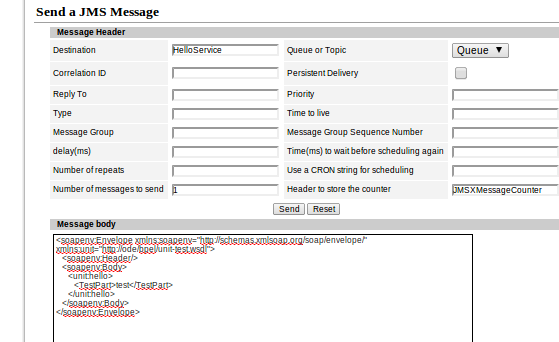 You can generate the sample message for the HelloService wsdl using soap ui.